We've introduced a new data menu to our city search that reveals building statistics for every commercial property in our database. This menu is now accessible to all users before or after a visual search for commercial space. 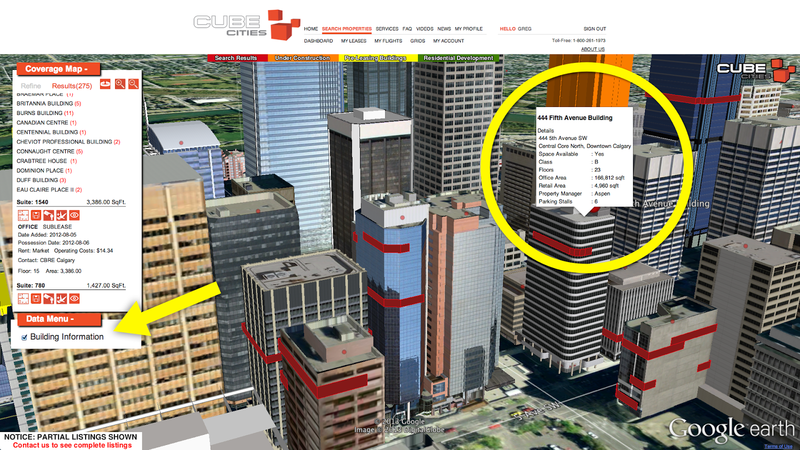 Simply check the Building Information box and small red points will appear on the rooftop of every building. Mouseover the points and the building name will appear, click to see the details such as building type & class, number of floors, office and retail square footage, building architect, property manager, operating costs and more. Here's a video illustrating building information points in Toronto, Chicago and Manhattan. Keep watching the building information windows, we'll be adding new property data soon. Sign up with Cube Cities to explore this new data source.